The Elite® SC-LX901 featuring 11.2-ch Class D3 amplifier is fully-equipped for the latest multi-dimensional surround sound formats, DTS:X™ and Dolby Atmos®, featuring the Reflex Optimizer for Dolby enabled speakers. With Ultra HD (4K/60p/4:4:4) upscaling/pass-through and HDR/BT.2020 standards ready, 4K images are ever more impressive. In addition to internet radio and various network streaming services, with Google Cast™* built-in you can use your mobile device to cast your favorite music to the SC-LX901. The multi-zone feature supports powered ZONE 2/ZONE 3 output. * Google Cast will be available with future firmware update. With the Class D3 Direct Energy High fidelity class D) Amplifier, the SC-LX901 is ready to meet the needs of the latest HD content. With our MOSFET, the Direct Power FET, this simple, high powered solution is provided to fully meet today’s AV entertainment standards. The custom bypass capacitors further enhance the advantages of the Class D3 amplifier, producing powerful bass while also delivering the subtle details. With Class AB amplifiers, driving all channels at full power is only possible for a short time, at around 300 W to 400 W power output. The SC-LX901’s Class D3 Amplifier has the ability to simultaneously drive 11-channels at 850 W power output, while efficiently delivering dynamic content. The Direct Power FET is directly connected to the print circuit board without any additional wiring. This simple structure maximizes audio performance by reduced noise and improved switching, offering a quick-responding sound, perfect for digital content playback. The Class D3 Amplifier has been designed with a simple structure to take a straight and short signal path, resulting in improved sound quality. The SC-LX901 is equipped with dedicated ICs on the circuit board, all in the pursuit of delivering crisp, clean sound. The operational amplifier IC for processing small signal is set apart from the amplifying section to prevent mutual interference. This allows clear signal to be transmitted to the Direct Power FET. The simple form of the Direct Power FET has the advantage of improved thermal characteristics. In addition to the upper-side heat dissipation from the heat sink, the circuit board’s heat radiation feature is also utilized for downward heat dissipation, providing efficient cooling for a superior performance. Dedicated ICs are lavishly used on the circuit in pursuit of ideal sound. The Op-amp IC for processing small signal is set apart from the amplifying section to prevent mutual interference. This allows clear signal to be transmitted to the Direct Power FET. Additionally, the Rubycon chip film capacitor MU 25p further reduces the influence of residue noise from the high power section. 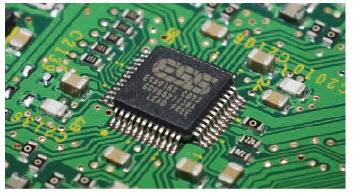 The highly acclaimed 192 kHz/32-bit ESS SABRE32 Ultra DAC (ES9016S) is adopted to deliver exceptional sound, with ultra-low distortion and high signal-to-noise ratio. It offers jitter-free performance for an astounding audio reproduction with rich deep bass, maximizing the full potential of Pioneer’s Class D3 amplifiers. 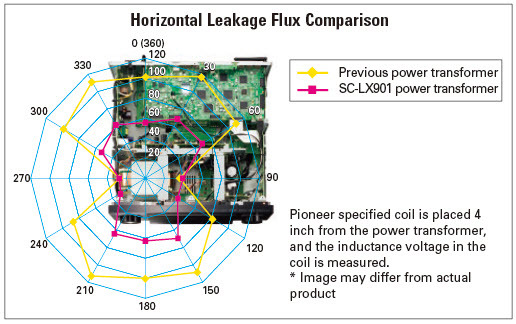 The power transformer features minimum leakage flux, ensuring low noise with increased S/N ratio. The SC-LX901 is compatible with 7.2.4ch/7.2.2ch/5.2.4ch configuration of the latest home theater sound platform, Dolby Atmos. The SC-LX901can reproduce object-oriented compapatible movies/music in smooth, curving movements, or the realistic three-dimensional movement overhead by utilizing Dolby Atmos Enabled and/or in-ceiling speakers. Using the Pioneer Elite Dolby Atmos Enabled Speakers you will need the following in order to use the Dolby Atmos-enabled capability of these speakers, the listening room ceiling should have horizontal flat hard surface (for audio reflection) and a height of 8’ to 14’. DTS:X is the next-generation audio codec from DTS that leverages object-based audio to enable new immersive and interactive audio experiences. Since DTS:X can automatically adapt the audio to the existing channels and speaker system, no specific speaker layout is required. Experience an immersive soundscape with incredibly rich and life-like audio. The SC-LX901 has Google Cast built-in, the same technology behind Chromecast, so you can use your mobile device to cast your favorite music, radio, or podcasts to the SC-LX901. You can control the audio from anywhere in the house using Cast-enabled apps running on your personal device—iPhone, iPad, Android phone and tablet, Mac and Windows laptop, and Chromebook. Discover Cast-enabled apps at g.co/cast/audioapps. This feature lets you take advantage of the highest-quality video source for viewing on a 4K TV. With support for HDCP 2.2, you can enjoy premium content such as 4K videos with digital copy protection on a compatible display. What’s more, the SC-LX901 is ready for the HDR (High Dynamic Range) and BT.2020 next generation video standards. * Supports up to 4K/60p/4:4:4/24-bit with HDCP 2.2 on HDMI IN (1/2/3/4/5) and HDMI OUT (MAIN/SUB). MCACC Pro, the pinnacle of Pioneer’s auto room tuning technology, analyzes the phase and group delay characteristics to precisely control phase differences between speakers. MCACC Pro corrects phase differences in all ranges and all channels, from phase difference in the original audio material to the sound emitted from the speakers. Required microphone included. The Advanced Sound Retriever restores the output of compressed audio—such as WMA, AAC, and MP3—to the level of CD sound. The technology creates new signals to restore the minor details left out during the compression process. Advanced Sound Retriever for multi surround sound is compatible with DVD soundtracks featuring Dolby Digital or DTS. When using Dolby enabled speakers, high directivity sound reflects off the ceiling, while low directivity sound directly reaches the ears. This difference causes a phase shift, making the sound feel unbalanced. To solve this, the new technology optimizes the performance of your up-firing elevation speakers for your listening environment, by aligning the phase of direct and indirect sound, matching the basic tone, and optimizing the upward-oriented frequencies. The result is overall seamless sound with Dolby enabled speakers, allowing the ideal reproduction of threedimensional surround sound. The SC-LX901 will support FireConnect™ Powered by Blackfire* with a future firmware update. FireConnect is a stable wireless protocol that mirrors most audio sources connected to the AV receiver—from vinyl to streaming audio—on optional FireConnect compatible speakers** in other rooms. 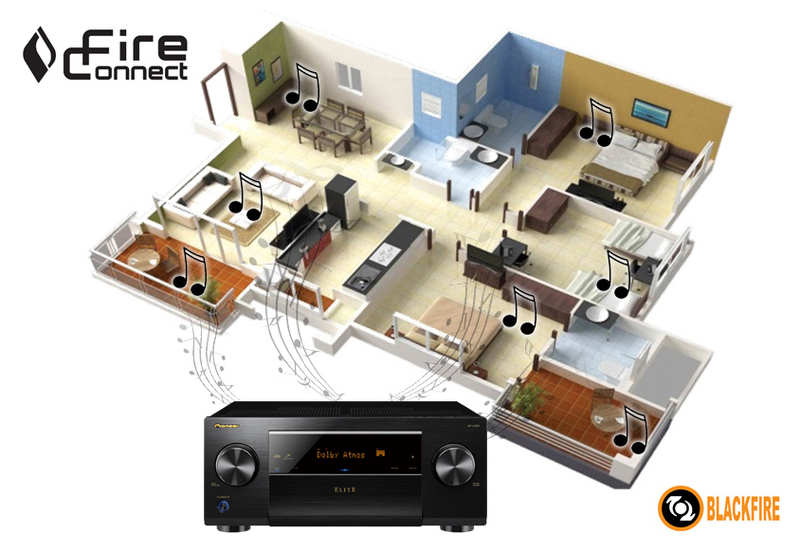 * Multi-room Audio is realized by FireConnect technology. FireConnect is a technology of Blackfire Research Corp, USA. We do not guarantee that the SC-LX901 will support all devices incorporating FireConnect. ** FireConnect compatible speakers will be released at a later date. Less is more in circuitry design. Advanced Direct Construction allows the shortest and simplest signal paths—from input to output, circuit block by circuit block—to reduce distortion that can be caused by transmission loss, and to improve sonic clarity. The 3D Space Frame Construction is developed to clearly define the mechanical grounding of the chassis and make the structure strong enough to support heavy weight. Perfected by repeated CAE strength analysis and tests, this technology allows each part to deliver maximum performance. Interference is also reduced by separating and insulating the power supply, amp, analog circuit, digital circuit and video sections from one another. 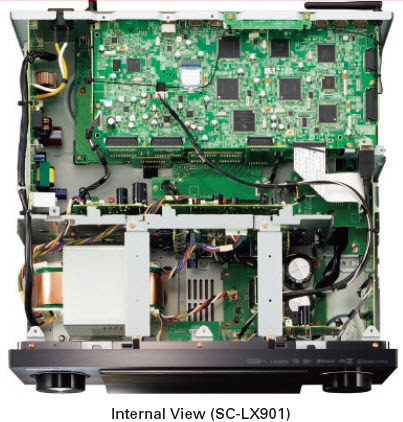 The SC-LX901 comes with this Advanced 3D Space Frame structure, featuring precise framework design, separating the power supply block, and isolating the analog video/audio and digital functional blocks into specific compartments. This reduces interference by flat cables between the blocks and improves the operating characteristics to accurately reproduce even the most delicate signals. 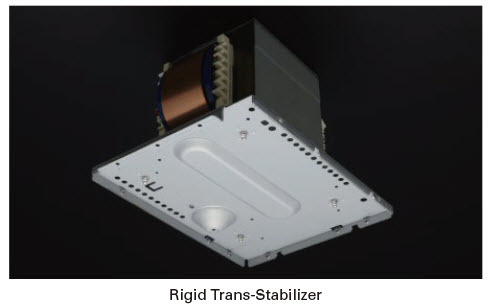 The rigid trans-stabilizer acoustically insulates the transformer and eliminates unwanted vibration, enhancing sound clarity. The Anti-Standing Wave Insulator has been developed through repeated listening tests, featuring a special form with no parallel sides inside to prevent cavity resonance. This makes the sound localization, tone, and scale clearer, while also enhancing the seamless connection between the channels, and the response to quick sound. The insulator enriches the realistic spatial description for movies, and the space representation of a concert hall for music sources. Being compact and highly efficient, the Class D3 amplifier has allowed remarkably smaller heat sink and greater flexibility in circuit design and layout, and the ideal separate structure with independent pre and power amplifier blocks is realized. Additionally, the power supply for digital and analog circuits has been isolated to provide clean power, significantly contributing to clear signal transmission which is the basis for high-quality sound. Steel plates shield the power amplifier block to eliminate unwanted noise caused by mutual interference, while Pioneer original Insulated Dual Chassis connects the power amplifier’s chassis to the main chassis via special insulators. The pre and power amplifier blocks are electrically separated, enabling the optimal ground design for each block. With thorough clean grounding and elimination of interference between the circuits and load changes, the sound quality and performance equivalent to separate amplifiers combined within a single chassis is achieved.